“Much of Standard & Poor’s analysis centers on the California State Compensation Insurance Fund (State Fund, or SCIF), which has “soaked up like a voracious sponge business abandoned by other insurers’ flight or failure,” the report states. After a six-fold increase in premiums in just four years, SCIF’s premiums/surplus ratio reached the “very precarious” level of 3.7 for 2003, compared with a safe level of 0.9 in 1999. “State Fund could be in serious trouble if pricing for newer business proves inadequate,” said Standard & Poor’s credit analyst Jason Jones. Industry trends point to a consistent decline in claims frequency, but a disturbing trend towards increased severity. In other words, the number of claims is trending down, but the cost of claims is trending up. Part of this is due to skyrocketing medical costs. Claims costs include both wage replacement and medical benefits. Historically, wage replacement has represented the larger share of the claims dollar, but recently, medical benefits has edged ahead as the leading cost. No surprise – health care has been rising at or near double-digit rates for a few years now. Prescription drugs are an increasingly larger piece of the medical pie for workers compensation costs. According to Joseph Paduda of Health Strategy Associates, the costs for prescription drugs associated with workers compensation claims total approximately $2.5 billion a year, and are increasing at an annual rate of 13 to 17 percent. Despite this hefty price tag, it is interesting to note that workers comp expenditures represent less than 2% of the nation’s total drug costs, a fact that has significance in terms of the potential arsenal of cost-control strategies. Joe discusses some of the reasons for this trend in an essay, Why Can’t We Control Drug Expenses? “The ruling means that the brothers’ personal assets can be tapped to pay the more than $1 million fine levied against their company, Derco LLC, for not having the insurance in place when their nightclub burned, killing 100 people including four employees. The ruling is under appeal. There is some legal wrangling going on about whether owners and managers of limited liability companies can be held personally responsible for fines and penalties. Suffice it to say that state authorities take a dim view of this type of employer fraud and penalties can be severe. Employers can be required to pay compensation plus a penalty for any injuries or deaths. Other penalties might include substantial fines or jail time. Also, because the employer has not held up their responsibilities under law, the “exclusive remedy” shield may be pierced, exposing the employer to civil suits. Last week, we wrote about another case of on-the-job fatalities in Florida where the employer did not have workers compensation coverage. In this case, as they have done in other premium fraud cases, Florida authorities issued a stop work order, shutting the business down. Many experts think that failure to secure workers compensation coverage may well be the largest single source of workers compensation fraud. And like all insurance fraud, it is often the honest insureds that pay the freight one way or another. In California, for example, caring for injured workers of uninsured employers costs the state almost $25 million a year. However, the parties that generally pay the steepest price for this type of fraud are the injured or deceased employees and their families. Felony for willful safety violations – legislation gaining traction? The proposed legislation is sponsored by Sen. Mike Enzi, R-Wyo., and observers think it may gain some support among Republicans. The Enzi bill caps penalties at an 18-month jail penalty rather than Corzine-Kennedy’s 10-year jail provision. This will bear watching when congress is back in session. Opponents think we should just enforce existing regulations, but that’s unlikely with OSHA growing “kinder and gentler’ with each passing year. Willful and serial safety violators who play fast and loose with workers’ lives violating basic safety standards need to be held accountable, and this accountability requires something more than a slap on the wrist. Ron Hayes came by the courage of his convictions the hard way. His 19 year-old son was smothered when 60 tons of corn collapsed on him in a silo that he was cleaning for his employer, Showell Farms. Ron had little help from OSHA – in fact, he was stonewalled by the agency – despite the fact that Showell Farms was found to have six “willful violations”. After losing his son, Ron quit his job as an X-ray technician, and he and his wife turned thier efforts to founding FIGHT – Families in Grief Holding Together to provide mutual support and to work to the prevention of future work deaths. Their motto: Mourn for the dead and fight for the living. Posted in Safety & Health | Comments Off on Felony for willful safety violations – legislation gaining traction? I stumbled on an interesting essay at the Florida Department of Financial Services’ site…it’s an overview of the historical evolution of workers compensation from ancient times to the present, one of the best treatments I’ve seen on the topic. In addition to exploring the European roots, it presents an overview of the system’s development throughout the United States, with particular emphasis on legal developments in Florida. “Barristers, solicitors and others with legal knowledge and training came forward in increasingly large numbers from 1850 forward and represented the injured workers on a contingency or percentage of what they could collect basis. Although the burden of proof was on the worker as well as other legal expenses, the courts became backlogged and the general public suffered from this unfair and inefficient system as crowded dockets and few judges delayed other civil actions. In the midst of this chaos and confusion, it was noticed that the worker was beginning to prevail in these actions and with the growing legal profession’s assistance were tying up attaching machinery, buildings and property of the employers through liens and attachments. 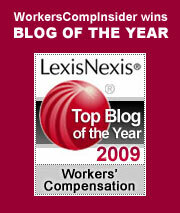 Here in the United States, workers comp wasn’t enacted in this country until 1911. Wisconsin was the first state to adopt a law, and by 1948, every state had some form of “workman’s comp.” At essence, this social insurance is a pact between employers and employees. Employers are mandated to cover medical care and provide wage replacement for injured workers; in exchange for this protection, the workers compensation becomes the exclusive remedy for workers. Although the courts have upheld this doctrine for nearly a century, in some instances, such as willful intent or bad faith, court challenges have succeeded in piecing the exclusivity. For history buffs, here’s another historical overview entitled Workers Compensation, Federalism, and the Heavy Hand of History (pdf). It’s a long and academic treatment that explores why workers comp remains the purview of state rather than the federal government by looking at the system’s historical roots. And for our northern neighbors, I present the Evolution of the Workers’ Compensation System in Canada. Minnesota’s Department of Labor and Industry just issued a Workers’ Compensation System Report that covers data and trends in the state’s system from 2000 through 2002. The good news? Claims fell by more than 15% during that time. The bad news? ” … cost per $100 of payroll rose 18 percent during the same two-year period. The report estimates the cost rose to $1.58 per $100 of payroll in 2002 from $1.34 in 2000. This echoes a national trend of a decrease in frequency and an increase in severity. Also, for the first time in the state, the medical portion of the claim eclipsed the indemnity portion in terms of overall costs. The full report can be accessed online through the link provided above. A few weeks ago, there was a horrific Florida construction accident that claimed the lives of two workers and injured several others. While laying concrete on the third floor of a new condominium complex, the roof collapsed. News reports of the accident were anguishing – many workers barely jumped to their safety, with others trapped by debris and hardening concrete, coworkers scrabbling frantically to save them. One man was trapped in concrete to his waist but managed to extricate himself before it hardened. “After the awful screeching of the collapsing luxury townhouse building, the first sounds Arturo Ruiz Gil heard were his co-workers’ cries for help. The 20-year-old construction worker had just fallen 30 feet from the top of the building onto a wet concrete surface. Pushing aside the rubble, he managed to crawl out with his brother, Andres Ruiz Gil, and uncle, Valentin Ruiz, before the concrete hardened. “We kneeled down, all three of us, and prayed to God and to the Virgin of Guadalupe to help us and help the ones who were trapped,” Andres Ruiz Gil, 19, said. Almost immediately, some unusual things were apparent. One of the workers who narrowly escaped injury was a 13 year-old boy, a potential violation of child labor laws. The subcontractor had a history of OSHA citations and fines. And more recently, it was learned that the subcontractor did not have workers compensation coverage for his employees as is mandated by law. The state of Florida has recently been cracking down on just such employer fraud, and they stepped in slapping a stop work order on the construction subcontractor. (This linked story in Insurance Journal also has an interesting discussion from readers.) Under the law, the offending employer could be liable for fines of 1.5 times the amount of the coverage avoided a day in damages. Other fines and charges could be brought depending on the accident investigation. For example, most states are extremely strict in enforcing child labor laws. This is a sad and terrible story for so many reasons. Rarely are fatal work accidents freak events – most could be prevented with adherence to safety rules and OSHA standards. It also echoes a shameful story we’ve addressed here before – the heightened vulnerability of Mexican workers whose on-the-job death rate is two to four times higher than other workers. Good news for workplace safety advocates. In response to a Freedom of Information Act request by the New York Times, OSHA has been ordered to release company names and the worker injury and illness rates of the American workplaces with the worst safety records. This will allow reporters and the general public to identify the riskiest employers and will also provide the data to evaluate OSHA’s efficacy. Read more on this story at Confined Space. In a recent report, The Center for Studying Health System Change finds that the proportion of Americans under age 65 covered by employer-sponsored insurance fell dramatically from 67 percent to 63 percent between 2001 and 2003. According to Ross at The Bloviator, this change affects 9 million people, many in the 18-39 age range. Thanks to Tom at Inter Alia, we learn that The Joint Commission on Accreditation of Healthcare Information has launched a new version of Quality Check, a tool to compare the quality of medical care at more than 16,000 facilities nationwide. Tom points out that you can compare up to 6 organizations at the same time. According to a recent survey of 450 large employers conducted by Hewitt Associates, most employers don’t track the costs of employee absence. The study notes that almost one-third of the company’s polled had implemented absence management programs.